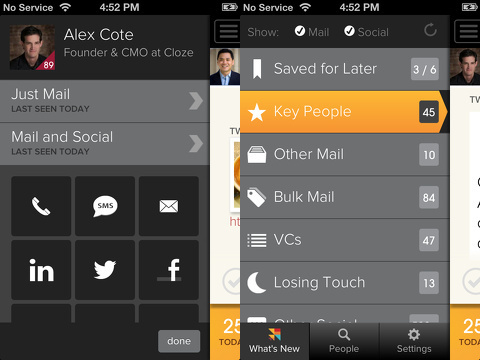 Cloze combines your email accounts with your Facebook, Twitter, and LinkedIn social networks into an intuitive, highly functional productivity iPhone and iPad app. It incorporates streamlined interface to allow replies, likes, comments, tweets, and endorsements from Cloze’s attractive iPhone app. The Cloze iPhone app requires several steps to authorize and sync accounts, as well as time to analyze and organize your contacts and information. The first step is to authorize your email accounts. You can add Gmail, Exchange, Yahoo, and other accounts. The Gmail account authorization required me to log-in to Google, authorize Cloze, and, for added measure, required me to do a mobile text authorization. The process was quick and painless. If you are syncing other accounts, the interface is similar to syncing your email to your iPhone via the iOS settings interface. The next step is to add your social networking accounts. The Facebook authorization has a couple of steps. First, you establish who, if anyone, can view your Cloze iPhone app activity. Then, you can opt in or out of three actions: post on your behalf, access messages in your inbox, and access posts in your news feed. You tap the x icon to the right of each of these to cancel that specific action. To take advantage of the full functionality of the Cloze iPhone app, you should allow all of these options. If you do not authorize all of these options, you will be re-routed to email your thoughts to your contact. LinkedIn simply requires a log-in authorization. 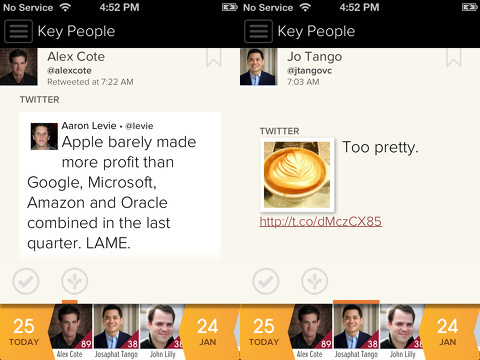 You interact with LinkedIn through a web page version within the Cloze iPhone app interface. Finally, Twitter requires a simple log-in and authorization to access your account, but does not allow Cloze iPhone app access to your Twitter password. After you have authorized these accounts, you will receive an email notification to let you know when your Cloze iPhone app is prepared. You are required to verify your account, and, then you get started. The Cloze iPhone app has a bold, visual style reminiscent of Pinterest, and the interface pulls from Facebook, Path, and Instagram. The bulk of the tools and functionality are stored in the left sliding menu accessed by the list icon in the top left corner. The options to view your content are listed, and with a touch, a new screen is filled and the menu bar slides off the screen. There are two sorting options for your left sliding menu–one at the top of the sliding menu and the other at the bottom. The top menu filter is a simple one touch sort to include mail only, social only, or both. The bottom menu is similar to Instagram with three icons to sort the sliding menu bar between what’s new, people, and settings. When you check out your what’s new feed, you will find the bulk of the screen is filled with the content, the name of your friend or contact, and the source of the information. You use horizontal swipes to move through the content. At the bottom of the screen are the profile photos of contacts sorted by date, so you can move through a timeline of people without the content they have shared. With a touch on a photo, you are transported to the profile page of that person in the appropriate social networking interface. For a LinkedIn photo, the web page version of the profile pops onto the screen. You can endorse him or her directly through the Cloze iPhone app with a couple of touches on the screen. At the bottom of the content, you can archive an email, or you can select appropriate actions to engage with the content with complementary options. For a Facebook status update, you can touch the arrow icon and three options pop up in a semi-circle in a way reminiscent of Path. You can like and comment from a pop-up at the top of the screen. The Cloze iPhone app also includes some interesting and fun features. For each item of content, you can also bookmark it and establish a time to revisit the item. In the settings menu, you can set parameters to archive messages appropriately to clear your inbox. For each person, a matrix of options to reach out are available from the sliding left menu bar. You can call, text, email, reach out through social media, and add a note. A great organization and productivity feature is the ability to add people to lists for the what’s new feed. If you are working on a project, you can add the principals to a list to quickly find just those messages and details. There are, unfortunately, a couple of hiccups that diminish functionality and appeal. You do not authorize a sync with your iPhone’s contacts, and that would help immensely. The matrix of options to reach out to a person is not complete. For example, I couldn’t call my husband. He doesn’t list his cell phone number on his Facebook page. The full depth and breadth of your options to connect may not be available to you with the Cloze iPhone app. Also, the Cloze score for your contacts is peculiar. For each contact, the engagement you have with that person is measured and a number is given. You can set a goal to increase engagement. The measurement is explained by touching the screen. For those who are goal-oriented and focused on sales, this would be helpful. But, for me, it’s just another organization post on Pinterest I’ll never achieve and hangs over my head. Functionally, the Cloze iPhone and iPad app has a well-organized interface to manage multiple social networks and email accounts, but it still needs to determine how to include all of your contacts to become an absolute must. AppSafari review of Cloze – The Inbox is Human Again was written by Jenni Ward on March 5th, 2013 and categorized under App Store, Contacts, Email, Enterprise, Free, iPad apps, Productivity, Social, Universal, Utilities. Page viewed 5046 times, 1 so far today. Need help on using these apps? Please read the Help Page. It combines multiple email with social networks? That is, for each social network can have an e-mail?